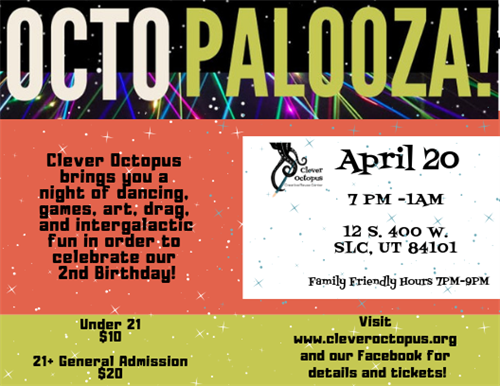 Clever Octopus brings you a night of dancing, games, art, drag, and intergalactic fun in order to celebrate our 2nd Birthday! Games of skill and drinks available all night! Every party is better as a costume party so we recommend dressing up! Pre-purchase tickets for games with admission tickets. 9pm - 10pm Drag Show - Drag queens will compete against each other wearing looks they crafted using materials from our Creative Reuse Center for the title of "Queen of the Multiverse." Drink tickets and more game tickets ($1/each) available for purchase at event. Bring cash to tip bartenders and queens. On-site personal costuming available for a $100 upgrade. Event space will be divided into a 21+ section and all ages section with stages in each. ** Clever Octopus Inc. is a nonprofit organization dedicated to fostering creativity and environmental awareness through art, science, technology, engineering, and math. ALL Donations and proceeds go directly to benefit the expansion of Clever Octopus' campus — featuring large classrooms, community gathering spaces, and more — that will allow us to divert more waste and provide additional creative reuse educational opportunities for youth, adults, and our community.